Right now, the ground underneath Yellowstone National Park is rising at a record rate. In fact, it is rising at the rate of about three inches per year. – the largest volcano in North America. and when it does the devastation will be almost unimaginable. up to 1,000 miles away, and it would render much of the United States uninhabitable. that could destroy our nation in a single day and now that beast is starting to wake up. The Yellowstone supervolcano is so vast that it is hard to put it into words. which rises to 30 miles underground before spreading out over an area of 300 miles across. they remember the catastrophic eruption of Mount St. Helens back in 1980. But that eruption would not even be worth comparing to a full-blown eruption of the Yellowstone supervolcano. And now the area around Yellowstone is becoming increasingly seismically active. in his 53 years of monitoring seismic activity in and around the Yellowstone Caldera. grounding thousands of flights and forcing millions to leave their homes. That is why what is going on at Yellowstone right now is so important, and the American people deserve the truth. #3 The next eruption of Yellowstone seems to be getting closer with each passing year. Since 2004, some areas of Yellowstone National Park have risen by as much as 10 inches. #8 A full-scale eruption of Yellowstone would cover virtually the entire midwest United States with volcanic ash. Food production in America would be almost totally wiped out. #9 The “volcanic winter” that a massive Yellowstone eruption would cause would radically cool the planet. Some scientists believe that global temperatures would decline by up to 20 degrees. around the world are starting to roar back to life right now as well. the volcano has registered 39 exhalations in the last 24 hours. The BBC notes that officials raised the alert level yellow following Popocateptl’s eruption on Saturday morning. Yellow is the third-highest caution level on the city’s seven step scale. forming its highest plume since the Japan Meteorological Agency started keeping records in 2006. Lava flowed just over half a mile from the fissure, and several huge volcanic rocks rolled down the mountainside. Though the eruption was more massive than usual, residents of the city of about 600,000 are used to hearing from their 3,664-foot neighbor. Kagoshima officials said in a statement that this was Sakurajima’s 500th eruption this year alone. This article first appeared here at the American Dream. Michael Snyder is a writer, speaker and activist who writes and edits his own blogs The American Dream and Economic Collapse Blog. Yep it would effectively destroy "the global warming scam" rather a heavy price to pay. There is still a lot of magma movement in the Yellowstone region. It appears that the magma movement is ongoing with no real let up. Something odd.. not to worry. edit: This looks like faulty instrumentation.. The readings being reported from seismometer inside Bore Hole #B944 are literally "off-the-scale." Is an earthquake brewing, or is this the beginning of a catastrophic eruption of the Yellowstone "Super Volcano?" Seismographic Printout from Yellowstone National Park, Bore Hole #B944, for February 1, 2014. The time stamp goes down the left edge. Look at what starts happening from 12:00 Noon for the rest of the day. By 3:00 PM MST, things get real dicey; by 5:00, it is clear there's real trouble happening underground. By 7:00 PM, the seismographic gear is totally overwhelmed; with all readings going utterly off the scale. This could be a sign that a massive eruption of the Yellowstone Super Volcano has begun deep underground. This email sent out explains all the preparations in FEMA Region Three and all the supplies being moved to the East Coast. FEMA coffins and all the military build up preparing for gun confiscations and martial law. Since late summer 2013, the Yellowstone GPS network has tracked a small ” ground deformation episode” in north-central Yellowstone National Park. During the past five months, the NRWY GPS station has recorded about 3.5 cm (1.4 in) of uplift (the ground is rising) and about 1 cm (0.4 in) of southeastward ground movement, relative to a stable reference station north of the Park. Measurements from other GPS stations in northern Yellowstone show smaller displacements, forming a circular pattern of deformation (circular — as in the round mouth of a volcano) consistent with a minor pressurization (building-up underground), about 6 to 10 km (4-6 miles) deep, near Norris Junction. What has scientists very concerned is that Yellowstone has suddenly begun emitting massive amounts of Helium-4. Helium-4 seems to be the predictor of activity, as proved with other volcanos. Doesn't sound good, does it. I'm worried about you too Jenetta. Notice they don't mention Canada when they talk about how much of the US it will effect if it goes. And Siri Arc! He's in Denver isn't he? Do we know anyone else who lives in the area? I've had a look in the past at the livecam at the Old Faithful and just decided to see what's happening there and on the website. The livecam appears to be down with no explanation in their update section. Coincidence? I'm noticing also that they seem to be keeping a check and updates on the RSOE EDIS site, noting 'Activity' at both the Yellowstone Caldera and the Island Park Caldera not too far away. You can get an up close look at the calderas and the earthquake activity currently there through the 'Details' link (7 around each one when I looked earlier). It's actually a little scary how MANY earthquakes are being shown occurring around the world at present, more than normally seen there, and how much activity and eruptions there are in volcanoes all over the world. There also seems to be a lot on the 'Earth Approaching Objects list' too which has to rattle things a little. [quote="Sanicle"]Doesn't sound good, does it. I'm worried about you too Jenetta. Notice they don't mention Canada when they talk about how much of the US it will effect if it goes. And Siri Arc! He's in Denver isn't he? Do we know anyone else who lives in the area? Don't have to worry about me Sanicle. If the volcano blew though big time, its outer radius would extend into Alberta and Saskatchewan. Yes Siri Arc is in Denver along with Lee Ellis (Music), Giovonni is in Washington. Harp rings and Nexrad? The whole globe would be effected from the dust in the atmosphere. Just what we need, a major Ice Age on top of a mini Ice Age. I remember when Mount St. Helens blew in Washington. I was in my early thirties at the time. Had my relatives visiting from Australia and I was living in Victoria, British Columbia at the time. It was early morning and fell off my bed from the shaking and cannon boom sounds. If I was Jewish, would have said it sounded like the Shofar on Rosh Hashannah. of the Yellowstone super volcano caldera. There was a herd of bison filmed charging out of a sulfurous steaming, heating, or rumbling section of the Yellowstone National Park. The news media promptly issued a report that this film was a hoax, and that the herd of bison was charging INTO Yellowstone, not out of it. Now, it really takes an idiot to dream up a lie like that to pacify and distract the public. However, these idiots are also criminals, because as the danger grows that many thousands of unaware people may be killed in such a horrific catastrophe, those who chose to conceal this threat from the public must be charged with murder in the second degree. African nations say they will refuse to accept millions of Americans fleeing Yellowstone explosion catastrophe. Buffalo herds being forced back into Yellowstone w/helicopters. 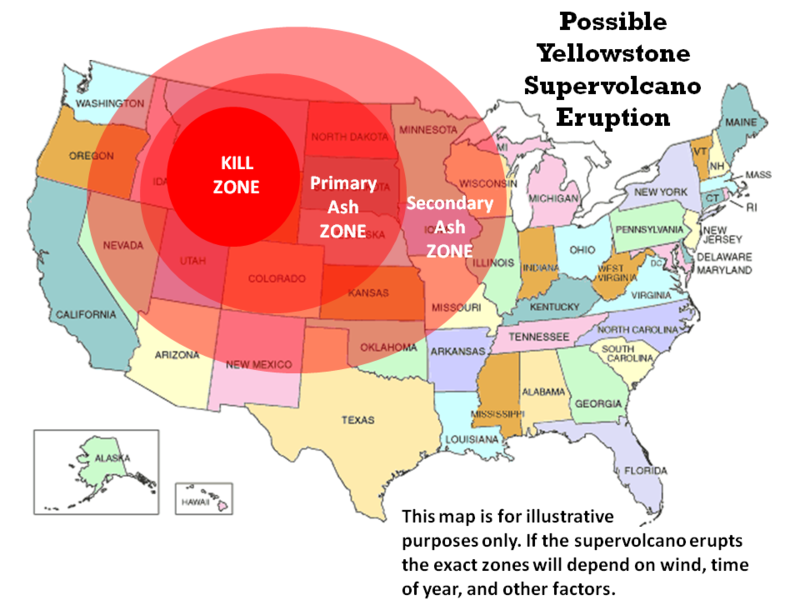 May 2014 – WYOMING - If the Yellowstone supervolcano erupts then millions of U.S. citizens could end up in Brazil, Australia, or Argentina. That’s according to the South African news website Praag, which said that the African National Congress was offered $10 billion a year for 10 years if it would build temporary housing for Americans in case of an eruption. The potential eruption of the supervolcano, one of the biggest in the world, has been a hot topic ever since videos of animals allegedly fleeing the area before an earthquake were posted online. Although the veracity of the claims haven’t been backed up, dozens of bloggers and others have been trying to figure out what, if anything, is going on. One of the latest theories is that the U.S. Geological Service and its partners, which keep an eye on the caldera, are hiding data from the public. The Praag article says that the South African government fears that placing so many Americans in South Africa could dramatically change the country. “The ever-changing thermal geology of Yellowstone National Park has created a hot spot that melted an asphalt road and closed access to popular geysers and other attractions at the height of tourist season, officials said Thursday. Most people understand that Yellowstone is sitting on top of a super volcano. The shifting earth and hot spots are nothing new. But the scientist now say that although this is nothing new, they have never seen it so severe. Literally turning asphalt to soup. This is something to keep an eye on, but don’t panic and don’t change your vacation plans, you may get to see something few people have ever seen before. I am including four videos to help you understand just what Yellowstone is and what scientists have been watching for Decades. In the first video, Daboo0077 weighs in on the current situation in Yellowstone today. The second video is from RT, describing the current situation in the park today. With more roads melting and gravel turning to oatmeal. The third video is a documentary on Yellowstone's history and what we can expect in the future from this supervolcano. The fourth video is How to survive a Yellowstone eruption. For preppers living in the Yellowstone area, this is a must see. Get the latest changes in Yellowstone condition as they happen. The access road to the Old Faithful geyser in Yellowstone National Park is being closed by park rangers because a supervolcano beneath the park is literally melting the roadway. Officials are prohibiting visitors from driving or stepping onto the asphalt, as what looks a solid surface can collapse and leave the unsuspecting guests stranded in a pool of hot water. RT’s Manila Chan takes a look at the frightening scene in Yellowstone. Yellowstone National Park lies on top of a magma chamber that is 35-miles wide, waiting to erupt. 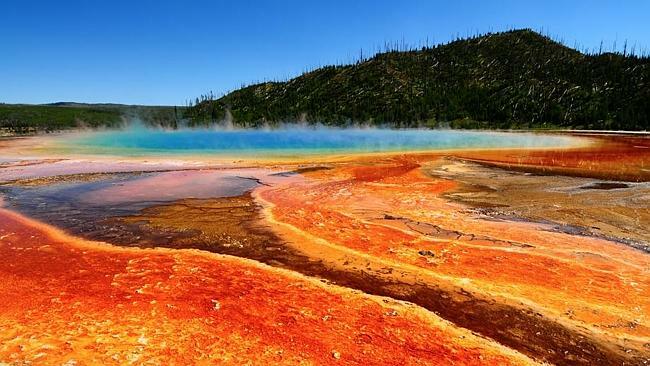 The Yellowstone Caldera is the volcanic caldera and supervolcano located in Yellowstone National Park in the United States, sometimes referred to as the Yellowstone Supe rvolcano. The caldera is located in the northwest corner of Wyoming, in which the vast majority of the park is contained. The major features of the caldera measure about 34 by 45 miles (55 by 72 km). The caldera formed during the last of three super eruptions over the past 2.1 million years. First came the Huckleberry Ridge eruption 2.1 million years ago, which created the Island Park Caldera and the Huckleberry Ridge Tuff. Next came the Mesa Falls eruption 1.3 million years ago, which created the Henry’s Fork Caldera and the Mesa Falls Tuff. Finally came the Lava Creek eruption 640,000 years ago, which created the Yellowstone Caldera and the Lava Creek Tuff. The last full-scale eruption of the Yellowstone Super volcano, the Lava Creek eruption which happened nearly 640,000 years ago, ejected approximately 240 cubic miles (1,000 km3) of rock, dust and volcanic ash into the sky. Geologists are closely monitoring the rise and fall of the Yellowstone Plateau, which measures on average 0.6 inches (1.5 cm) yearly, as an indication of changes in magma chamber pressure. They are preparing for this incident and it’s aftermath. You should be also. You need to get out and acquire the supplies you do not have at this time. Please stock up on as much food and water as possible and make sure you are Armed. This will not be easy to survive, but you can if you have a plan and keep a clear head and have No Fear. A grim report prepared by Commander-in-Chief of the Air Force Lieutenant-General Viktor Bondarev on the just completed scientific mission of North America carried out by Four Tupolev Tu-95 Strategic Aircraft and Two Ilyushin Il-78 Aerial Refueling Tankers that “electronically swept” for “magnetic anomalies” from Alaska to California warns that a “catastrophic event” may be nearing for this region. This report, however, states that this scientific mission was necessitated by a “severe mysterious magnetic anomaly” detected by the Kosmos 2473 satellite on June 3rd occuring in the Yellowstone Region of the Western United States which resulted in what is called an Earthquake Swarm. CHEYENNE, Wyo. (AP) — The ever-changing thermal geology of Yellowstone National Park has created a hot spot that melted an asphalt road and closed access to popular geysers and other attractions at the height of tourist season, officials said Thursday. "There are plenty of other great places to see thermal features in the park," Yellowstone spokesman Al Nash said. "I wouldn't risk personal injury to see these during this temporary closure." Naturally changing thermal features often damage Yellowstone's roads and boardwalks. Steaming potholes in asphalt roads and parking lots — marked off by traffic cones — are fairly common curiosities. "We've got some ideas. We're going to try them. Our maintenance staff has really looked at the issue," Nash said.